Well they asked us back for more!! We could’ve have been any happier with the news! 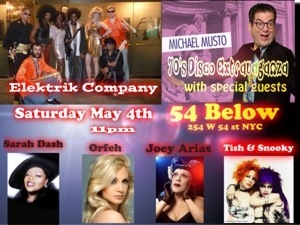 And we are happy that Michael Musto will join us again for some Disco fun! The last show we did in February sold out within days of advertisement. The buzz was on and it was amazing! We hope it will be again! This time around, the weather is nicer and not like it was with the sub zero temp, It’s a Saturday night at Studio 54! How much cooler than that!! The big news is that we are sharing the stage and joined by the incredible Sarah Dash herself. Mrs, Dash is known from the group Labelle and for her Disco hit Sinner Man. She will be performing Lady Marmalade with the incredible voice of Orfeh! and also performing her hit Song Sinner man live with the band. We are giddy with excitement! As Mentioned Orfeh will return as well as Tish and Snooky. They blew the roof off the last show so if you missed that, you’ll get your chance to see them in action again! Last but not least joining us is the most awesome Joey Arias ( with a twist)! Mrs. Arias have been playing plenty of shows in and around NYC for quite a while doing everything from Cabaret to performance art and Dance shows! Joey was known for his appearance with David Bowie and Klaus Nomi. If some of you grew up watching SNL , you probably seen that live performance in ’79. We can’t wait for this show! And hope to see many of you dancing on the dance floor. Word of advice, get your tickets soon. 54 below holds 180 people tops we think? It is a intimate room and they do remove the tables and chairs for dancefloor. But judging from last show, tickets went fast! We don’t want anyone to miss out! Keep Disco Alive!! we know it’s everyone’s guilty pleasure!